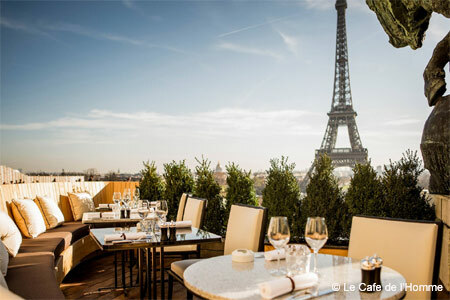 Eat while contemplating the Eiffel Tower. : Café de L’Homme is rich with history for a number of reasons. It is in the Musée de l’Homme located at the Palais de Chaillot, place du Trocadéro, in front of one of the most famous structures in the world, the Eiffel Tower. But the story goes a little deeper: Coco Coupérie-Eiffel is a great-granddaughter of Gustave Eiffel himself. Every day she can admire the monument which often symbolizes France, built by her ancestor. At lunch or dinner, the 300-meter grande dame will salute you if you are seated on the terrace; unfortunately, the views are not as good in the dining room. Under the guidance of partner Christophe Bonnat, the cuisine has improved and the establishment has evolved into more of a restaurant than a café. Expect traditional fare like Bordeaux oysters, poule au pot and lemon tart. Apropos for its location, you will find a cheese plate composed exclusively with French cheeses. Same goes for the wine list, with a selection of only French wines. Among the famous guests seen there are Bill Clinton and Eva Longoria. This is far from a tourist trap, and after a visit you will be eager to return (do insist on the terrace).